George Graham Reviews John Doyle's "Evening Comes Early"
Over the past couple of decades, there has been something of a stylistic divide between Celtic music from Ireland and Scotland, and English folk music. While both have been experiencing a revival of interest in over the past several years, until fairly recently, they have remained more or less distinct in sound, even though some of the same traditional songs are performed by artists in both styles. One of the differences is in the prominence of the guitar. In Celtic music, fiddles, pipes, whistles and even mandolin tend to take a more prominent role in an ensemble than the guitar, which is not often featured as a lead instrument. But since the days of the English folk groups of the 1960s, the guitar has been quite prominent, and the style has given us some outstanding players, including Davy Graham, Bert Jansch, John Renbourn, and Martin Carthy. Lately, the stylistic differences are starting to blur, with English singer Kate Rusby's recent CD being a fine example, borrowing as it does from both the English and Celtic traditions. This week, we have a fine album by an Irish guitarist, who by the mere nature of the prominence of his guitar, creates music that could be called Pan-British Isles. 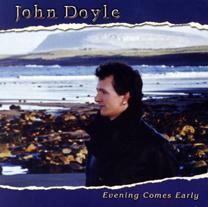 The CD is Evening Comes Early by John Doyle, the founding guitarist with Solas, a band that has been one of the brightest lights on the Celtic scene since the mid 1990s. Even regular fans of Celtic music might be hard-pressed to name a prominent guitarist in the field, and in Solas, a group known for for their uniformly virtuosic musicianship, Doyle did not take a very prominent role. The Dublin-born Doyle recently left Solas to pursue a solo career. This CD is his debut, and it proves to be very impressive. It is also his first outing doing lead vocals on record. Prior to his involvement in Solas, Doyle, who grew up in a family of musicians, joined Susan McKeown in the group Chanting House at age 16, and moved to New York, where eventually, Doyle, multi-instrumentalist Seamus Egan, vocalist Karan Casey and others formed Solas, dividing their time between Ireland and the US. Solas has always been known for their eclecticism, unafraid to give a Celtic twist to music like that of Woody Guthrie, and Doyle's CD also reflects that philosophy. There is music from both sides of the Irish Sea, as well as both sides of the Atlantic. Doyle also cites Martin Carthy as a prominent influence. One can also hear the influence of English folk groups like the Pentangle, including a couple of songs that have been part of the Pentangle repertoire. And on Evening Comes Early, Doyle adapts some American folk songs. The sound of this CD is decidedly more intimate than most of Solas' recordings. Some tracks are solo performances, while many songs feature the help of just one or two other players, including multi-instrumentalist and co-producer Michael Aharon, plus Solas colleagues Karan Casey helping with the vocals, and John Williams on concertina and pipes. One track features the lead vocals of Doyle's father, Sean Doyle. While many of the songs have a sound more reminiscent of English folk, Doyle also includes four instrumental medleys of reels and jigs, keeping the Irish influence intact. All of it is marked by a high degree of tastefulness, and a generally intimate, understated sound. While the guitar has not been very prominent in Irish and Celtic music, it's not surprising that John Doyle would be the one to make an album featuring his instrument in the style. With his tenure in Solas, probably the most innovative Celtic band since the Chieftains, with their combination of instrumental virtuosity and eclecticism, Doyle brings that approach to his debut solo album Evening Comes Early. His influence by some of the great English folk guitar players is apparent and creates a nice fusion of styles that incorporate both facets of British Isles music. American folk adds a further ingredient, with the CD's recording site of Philadelphia perhaps contributing to that influence. Whether you are a fan of the wide-ranging Celtic music for which Solas has been known, or whether you enjoy the English style folk of groups like the Pentangle, or are just a fan of subtle acoustic guitar work, John Doyle's Evening Comes Early is a most worthwhile CD.